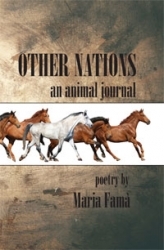 Maria Fama's poetry takes us into the hearts and souls of animals -- domesticated, feral, captive, free. Her poems challenge the notion that animals are on this planet solely for humans to use and exploit. Instead, the poems recognize the individuality of each animal with the view that animals are, as the naturalist Henry Beston saw them, "other nations, caught with ourselves in the net of life and time, fellow prisoners of the splendor and travail of the earth."